The Color Management submenu contains commands which let you change the ICC color profile associated with an image and also let you save the associated ICC color profile to disk. 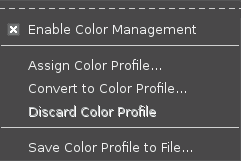 There are five options in the Color Management submenu. You can access this command from the image menu bar through Image → Color Management.